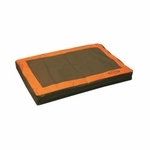 Mud River Memory Foam Dog Beds. 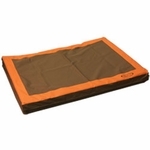 The Mud River Memory Foam Dog Bed gives your dog additional support and comfort for muscles and joints. It has better weight distribution when your dog is resting, and its rip-stop cover repels water and is removable for easy clean-up. The bed contours to your dog's body shape and alleviates pain pressure points. Available in Regular and Large sizes.